A few days after returning from London and Poland, I reluctantly boarded a flight to Minneapolis, where I attended a conference for two days. I’m sick of traveling. But I was very glad I had the foresight, long ago when I signed up to attend this conference, not to pay for a ticket to the banquet. If I wanted to eat, I had to venture out into the city. And what a pleasant city Minneapolis is! At least, in the late spring, early summer. After a search on-line, I settled on this shrine to roasted meat. My mind was made up when I read about the organic heritage pork they roasted for twelve hours. Brasa’s turned out to be an unpretentious place, staffed by young people, with a nice little patio area with tables. Families, couples on dates, and grandparents with kids sat around me while I studied the menu. I ordered a combo plate: braised beef, the slow-roasted pork with cabbage salad and creamed spinach with jalapeño. I was happy to see sensible portions when my plate arrived. The beef came in one piece but fell apart at the touch of my fork. It was immersed in a complex spicy sauce of chipotle chilies and tomato. The pulled pork bored me. I was happy it wasn’t dry, but it had little flavor. The cream in the spinach was crème fraiche (good) but I couldn’t taste the jalapño (not so good). The cabbage salad satisfied me without wowing me. 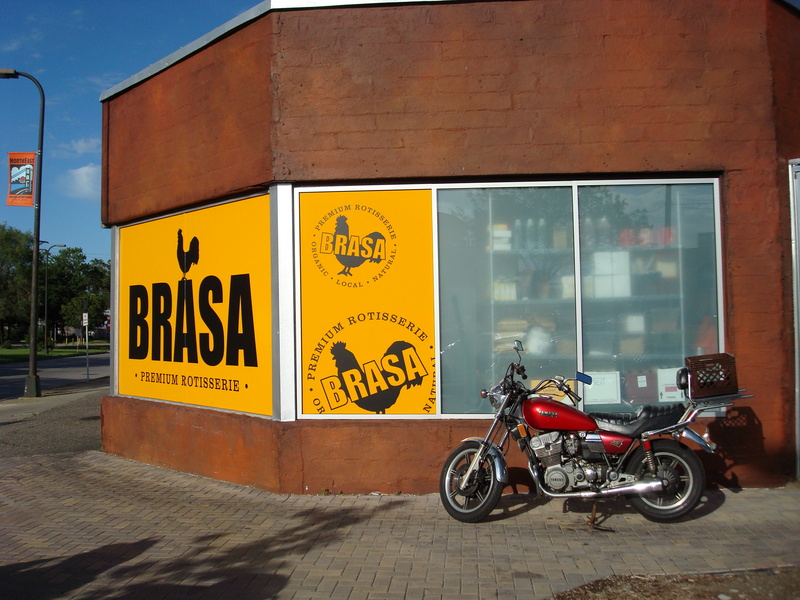 If I came back to Minneapolis, I’d give Brasa another go. The beef convinced me of that. But I wish they be more adventurous. Play around with the slow-roasted pork, people! It’s a wasted opportunity!